While you are alive, no matter what age, you should be free of pain and have a sense of strength and of good health, so that your life feels worth living. What you put on your skin and hair, along with what you put in your mouth and mind, is taken into your body to be transmuted into life, health and happiness. When all of your inputs are in harmony with nature's healthy options, your body becomes disease resistant, self-repairing, self-rejuvenating and toxin free; and because the skin is the largest organ in the body, it is one of the best ways we have of feeding and influencing all the internal structures, along with directly impacting on the health of the skin and hair. It is the synergistic effect of the ancient blend of these seven essential oils that provide such notable benefits, which have been known about since before the world underwent the catastrophes described by Plato, which, in the Timaeus and Critias, he puts at around 12,000 years ago. Some modern day geologists who are not dependent on the transnational ruling elite for their tenure, confirm that a world wide catastrophe occurred at that time. There is ample evidence that the ancient Egyptian pharaonic line survived that cateclism, and this blend is said to be used by them. Anyway, the synergistic effect of the Androgynae blend of seven essential oils is legendary, and in part, probably accounts for the health of our gene pool, since the phytosteroids in them alone contain essential DNA repair constituents. For instance, there is now ample evidence of cancer remission from the use of such e.o. 's as frankincence essential oil. 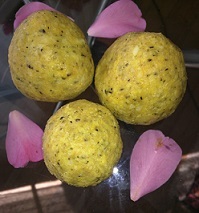 Androgynae soap contains pure soap flakes which are also combined with organic virgin olive oil, first pressed macadamia nut oil, sea buckthorn oil, pure hemp oil, crushed hemp seeds, and NZ manuka honey UMF10+. Olive oil has a similar molecular structure as hair, so it readily repairs and nourishes it, whereas macadamia nut oil has a similar molecular structure as skin. Sea buckthorn oil has been used since at least 5,000 BC for its healing and anti-aging action, and Manuka honey is antibacterial and excellent for all skin conditions and for its immune boosting abilities, partly because it exfoliates and fights free radicals in the skin. Since there are receptors for CB1 and CB2 structures (cannabinoids 1 and 2) all over the body, brain and immune system, hemp oil, which is Cannabis sativa with a THC (tetrahydrocannabinol) level of around zero, and crushed hemp seeds, these are included for those reasons; and because hemp's nutritional value of 3:1 ratio of omega-6 to omega-3 essential fatty acids matches the balance required by the human body; and especially considering that CB2 receptors are found in certain peripheral receptors, so absorption through the skin is rapid. Phytocannabinoids are critical to human and animal health as they keep the receptors working at maximal capacity and increase the efficiency of the endocannabinoid system which in turn regulates the endocrine system and energy balance. So the body has to have these chemicals, hence the endocannabinoid system produces its own cannabinoids, but it needs the chemical building blocks to achieve that, so its best to provide them outright from phytocannabinoids to avoid a deficiency; well at least the now "legal" CB2 in hemp, which is mainly expressed on the T cells of the immune system. Email scalardayspa@gmail.com if you would like to buy some Androgynae soap, or if you would like help with regards buying the ingredients to make your own.